Wastewater systems are one of those things that quietly do their job under the ground surface and nobody really thinks about it…until something goes wrong. Usually, we assume that what goes down the drain will stay down there and that wastewater odor control will keep it from offending our senses, but there are a few cases in recent history where things went seriously wrong. In April 2014, Flint switched its water source from the Detroit Water and Sewerage Department to the Flint River. They did this to save money. However, they neglected to apply corrosion inhibitors and other important water treatment procedures. Soon after the switch, Flint residents began to complain about the color and smell of the water. By August, E. coli and total coliform bacteria were discovered in the water and Flint residents were advised to boil their water. Following that, the Flint River was found to contain not only unsanitary bacteria, but also dangerous levels of THMs (trihalomethanes that are sometimes carcinogenic) and lead. In a water test at one resident’s home in February 2015, the lead content was 104 parts per billion (the EPA designates 15 parts per billion as the limit). After a study confirmed that the number of children with elevated levels of lead in their blood had risen since the water switch, the city finally made the switch back to the Detroit water supply. Altogether, 6 to 12,000 children were exposed to lead, 10 people died of Legionnaires’ disease, and nine government officials were charged with criminal indictments. This area in south Florida suffered from a series of 177 sewer spills from 2008 to 2012, which unleashed 50 million gallons of untreated sewage into the streets and waterways and caused the deaths of sea creatures caught in its wake. The sewer system, which was about half-a-century old, was in great need of repair, but funds to upgrade the system were slow to be approved by county officials. Finally, in 2013, Miami-Dade approved a $1.6 billion sewer settlement with federal and state environmental officials. This was designated to be used for sewer repair of the aging sewer system over the next 15 years. 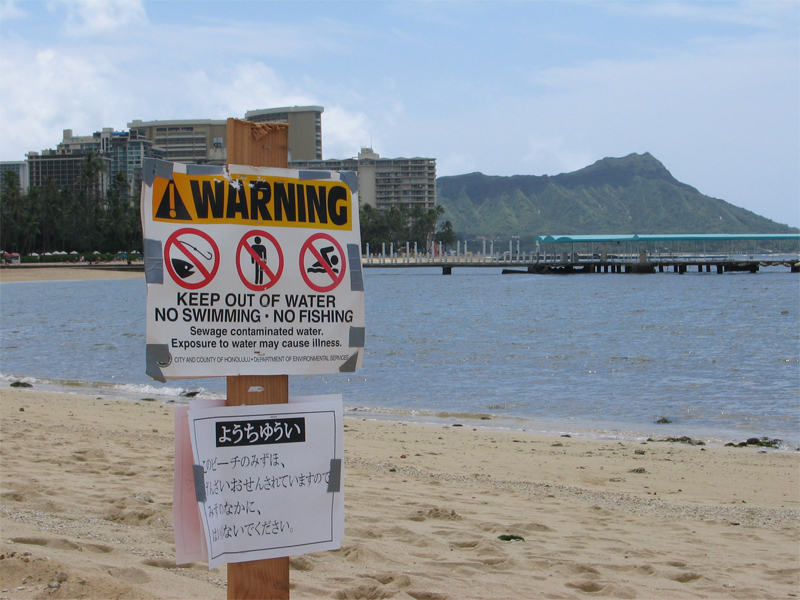 We all think of Hawaii as the islands of paradise, but in March of 2006, the waters of Waikiki were anything but a paradise. A heavy rainfall prompted the aging pipes of Waikiki to rupture and unceremoniously dump 48 million gallons of raw sewage into the Ala Wai Canal. It happened again in 2015, when Tropical Storm Kilo caused manhole covers to overflow and spill 500,000 gallons of raw wastewater into the ocean. The second malfunction was caused by people illegally opening manholes to deal with the flooding from the storm. No one wants a sewer disaster to strike. Because of that, it’s important that city governments take proactive action to ensure that sewer systems are repaired and updated and that residents cooperate by reporting strange smells (as sewer problems are often indicated by odors) and illnesses and, of course, avoid tampering with manhole covers.